Migration is a complex multidimensional issue that occurred throughout the history of humanity and will continue to do so in the future. In the article, “When Worn Out (African) Arguments are Repackaged for Mainstream Consumption”, the author exposes several of the key shortcomings and weaknesses of a recently published article in African Arguments which discussed migration in Eritrea. The critique of the African Arguments article serves as an important reminder that mainstream coverage about migration is frequently sensationalized, regularly lacks context, and is often deeply flawed. In this article, I briefly discuss several important points that are often overlooked or downplayed when discussing migration, both generally and with specific regard to Eritrea. 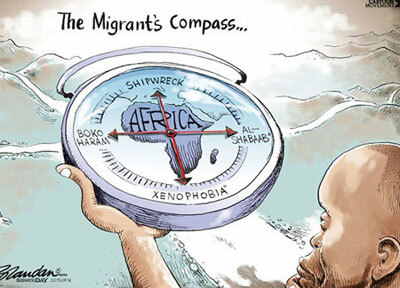 As was alluded to in the critique of the African Arguments article, most mainstream analyses of Eritrean migration completely fail to consider, either deliberately or through sheer ignorance, one of the key external “pull factors” that has contributed to migration trends from Eritrea – the longstanding de facto policy of Western countries to grant automatic asylum to anyone from the country. If discussions of Eritrean migration are to be regarded as truly objective, balanced, reasonable, and ultimately useful or worthwhile, this surely would be an area worth exploring and noting. Doing so would reveal how such policies (i.e. favorable treatment of certain groups of migrants) are not unique, are often intricately tied to broader foreign policy and geo-political machinations, and have often directly impacted patterns of migration. Extensive research has been conducted on how for over half a century, patterns of Cuban migration to the United States (US) have been an outgrowth of the fact that Cuban immigrants to the US have been awarded unique immigration privileges with a path to citizenship offered to no other foreigners. The granting of special privileges is firmly grounded in US foreign policy and was implemented in order “to sap the Cuban regime of its talented citizens and highlight Cubans’ preference for capitalist democracy over communism” (Eckstein n.d.). The similarities with the politicized approach that has been applied to Eritrea are quite clear. Furthermore, while Haitian migrants may face considerable challenges in posing as Cubans once they reach American shores, nationals of countries bordering or near Eritrea face a much less difficult time in posing as Eritreans. Interestingly, to date, inadequate attention has been given to considering the influence of this special treatment on patterns of migration from Eritrea and the Horn of Africa. Additionally, it is often claimed that migrants and refugees increase unemployment rates by undercutting wages and “stealing” scarce jobs, and also that they are a drain on host countries, with migrants frequently labelled as benefit seekers or welfare tourists. In contrast, however, the reality is that migrants generally avoid countries of high unemployment, and migrants – including low-wage and irregular migrants – make significant and valuable contributions to the socio-economic well-being of host countries. Research shows that most migrants do jobs that local populations shun or for which they lack the skills. Moreover, foreign-born populations are often net positive contributors to the welfare systems of many Western, developed countries. Despite the sheer complexity of migration, many discussions about “addressing” it are limited in scope and offer only crude solutions that are impervious to facts, logic, or reason. Of course, with migration being a fundamental part of the human experience and broader processes of globalization and change, the fact that it is frequently categorized as “a problem to be solved”, particularly by the media and politicians, may also be seen as a problem by many. However, quite often, there is a search for the quick, easy answer, with many of the fundamental causes and drivers – such as poorly-conceived, hubristic foreign interventions, disastrous invasions, and devastating military engagements and support for repressive, harsh regimes – being obscured or ignored. Moreover, there is no genuine consideration of the fact that truly addressing migration will require that more be done to reduce poverty, decrease global inequalities (both within and among countries), and promote inclusive, sustainable socio-economic development within origin countries.